Michigan Central Station (also known as Michigan Central Depot or MCS), built in mid-1912 through 1913 for the Michigan Central Railroad, was Detroit, Michigan's passenger rail depot from its opening in 1913 after the previous Michigan Central Station burned, until the cessation of Amtrak service on January 6, 1988. At the time of its construction, it was the tallest rail station in the World. The building is located in the Corktown district of Detroit near the Ambassador Bridge approximately 3⁄4-mile (1.2 km) southwest of downtown Detroit. It is located behind Roosevelt Park, and the Roosevelt Warehouse is adjacent to the east. The city's Roosevelt Park serves as a grand entry way to the station. It was added to the National Register of Historic Places in 1975. Restoration projects and plans have gone as far as the negotiation process, but none have come to fruition. In 2011, the building was to get new windows but the owner never followed through. 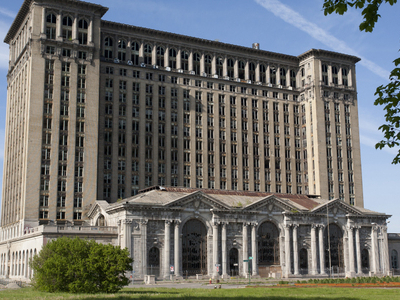 Full restoration of Michigan Central Station would be a large-scale project requiring significant investment. Here's the our members favorite photos of "Railway Stations in Detroit". Upload your photo of Michigan Central Station!